The charming robot at the heart of Disney’s Big Hero 6, Baymax, isn’t exactly realistic, but its puffy bod is an (admittedly aspirational) example of the growing field of soft robotics. And now Disney itself has produced a soft robot arm that seems like it could be a prototype from the movie. Created by Disney Research roboticists, the arm seems clearly inspired by Baymax, from the overstuffed style and delicate sausage fingers to the internal projector that can show status or information to nearby people. The mechanical parts of the arm are ordinary enough — it has an elbow and wrist and can move around the way many other robot arms do, using the same servos and such. But around the joints are what look like big pillows, which the researchers call “force sensing modules.” They’re filled with air and can detect pressure on them. This has the dual effect of protecting the servos from humans and vice versa, while also allowing natural tactile interactions. Presumably in this case the robot (also presuming the rest of the robot) would understand that it is being hugged, and reciprocate or otherwise respond. The fingers are also soft and filled with air; they’re created in a 3D printer that can lay down both rigid and flexible materials. 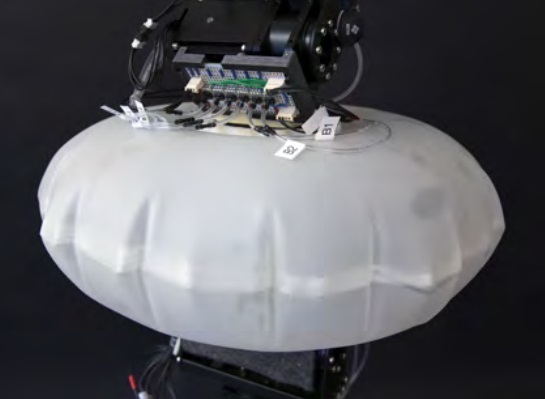 Pressure sensors within each inflatable finger let the robot know whether, for example, one fingertip is pressing too hard or bearing all the weight, signaling it to adjust its grip. This is still very much a prototype; the sensors can’t detect the direction of a force yet, and the materials and construction aren’t airtight by design, meaning they have to be continuously pumped full. But it still shows what they want it to show: that a traditional “hard” robot can be retrofitted into a soft one with a bit of ingenuity. We’re still a long way from Baymax, but it’s more science than fiction now.